A billionaire couple have forked out $10 million of their own cash to pay for care for some of the poorest children in society amid the continuing US Government shutdown. 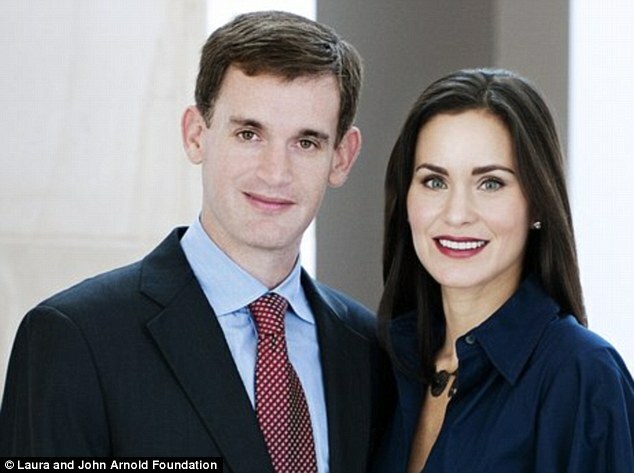 Laura and John Arnold have dipped into their personal fortune of $2.8 billion to reopen seven Head Start programmes in six states. The government shut down last week when Congress failed to agree a budget, although there are now said to be ‘glimmers of hope’ of a resolution, with President Barack Obama indicating he would accept a short-term increase in borrowing to avoid a default. Head Start programmes, which prepare about 7,000 youngsters described by spokeswoman Sally Aman as ‘the poorest of the poor’ for kindergarten, had been forced to close when the government closed many of its own offices last week. According to NBC, the centers had been expecting to receive their much-needed Federal grants on October 1, but when the Government closed its doors were left high and dry without the cash they needed to stay open. The philanthropic couple said in a statement: ‘We believe that it is especially unfair that young children from underprivileged communities and working families pay the price for the legislature’s collective failures. Executive director of Head Start National Association Yasmina Vinci said: ‘The Arnolds have selflessly stepped up for Head Start children to ensure their path toward kindergarten readiness is not interrupted by the inability of government to get the nation’s fiscal house in order. The Association added that many low-income parents are unable to pay for alternative care for their children and are forced to take time off work when Head Start centers close. Head Start spokeswoman Sally Aman said while the donation would allow many centers to reopen today, the ‘generous gift’ would not support Head Start programs if the shutdown continues throughout the month, affecting up to 11,000 other children. Mr Arnold made his fortune as a hedge fund manager. His wealth valued at $2.8 billion by Forbes. He and wife Laura have three children of their own. The couple started a charity foundation in 2008, although this money is being made as a personal donation. Their publicist Gary Larson said: ‘The Arnolds were both quite moved after learning about the impact the government shutdown would have on so many Head Start children, so they came forward personally, rather than through their foundation, and offered this assistance as their way of helping. While a resolution to the ongoing government stand-off is still some way off, Yahoo has reported ‘glimmers of hope’. According to the news website, President Obama said he would accept a short-term increase in the nation’s borrowing to avoid a default. In a separate development, a senate aide said Republican Senator Rob Portman was working on a plan to cut federal spending and reform the US tax code as part of a broader deal to reopen government agencies. Most lawmakers believe such a budget deal will be necessary to end the dispute. The President’s press secretary said Obama would accept a short-term debt ceiling increase in order to get past the potential crisis date of October 17, when the government hits the $16.7 trillion borrowing limit. A short-term increase would give both the Republicans and Democrats some breathing room, but will not solve the dispute alone.